UK directing hideous Yemen civilian bombing campaign. Is Parliament not interested? From the start of the hideous Saudi bombing campaign against Yemen 18 months ago, two countries have played active, vital roles in enabling the carnage: the U.S. and U.K. The atrocities committed by the Saudis would have been impossible without their steadfast, aggressive support. From the start, the U.S.- and U.K.-backed Saudis have indiscriminately and at times deliberately bombed civilians, killing thousands of innocent people. From Yemen, Iona Craig and Alex Potter have reported extensively for The Intercept on the widespread civilian deaths caused by this bombing campaign. As the Saudis continued to recklessly and intentionally bomb civilians, the American and British weapons kept pouring into Riyadh, ensuring that the civilian massacres continued. Every once and awhile, when a particularly gruesome mass killing made its way into the news, Obama and various British officials would issue cursory, obligatory statements expressing “concern,” then go right back to fueling the attacks. Saudi officials first lied by trying to blame “other causes” but have since walked that back. The next time someone who identifies with the Muslim world attacks American or British citizens, and those countries’ leading political voices answer the question “why, oh why, do they hate us?” by assuring everyone that “they hate us for our freedoms,” it would be instructive to watch that video. The Obama administration went ahead with a $1.3 billion arms sale to Saudi Arabia last year despite warnings from some officials that the United States could be implicated in war crimes for supporting a Saudi-led air campaign in Yemen that has killed thousands of civilians, according to government documents and the accounts of current and former officials. In other words, the 2009 Nobel Peace Prize winner was explicitly advised that he might be a collaborator in war crimes by arming a campaign that deliberately targets civilians, and continued to provide record-breaking amounts of arms to aid their prosecution. 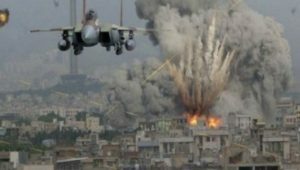 None of that should be surprising: It would be difficult for Obama to condemn “double-tap” strikes of the kind the Saudis just perpetrated — where first responders or mourners are targeted — given that he himself has used that tactic, commonly described as a hallmark of “terrorism.” For their part, the British blocked EU inquiries into whether war crimes were being committed in Yemen, while key MPs have blocked reports proving that U.K. weapons were being used in the commission of war crimes and the deliberate targeting of civilians. The U.S. and U.K. are the two leading countries when it comes to cynically exploiting human rights concerns and the laws of war to attack their adversaries. They and their leading columnists love to issue pretty, self-righteous speeches about how other nations — those primitive, evil ones over there — target civilians and commit war crimes. Yet here they both are, standing firmly behind one of the planet’s most brutal and repressive regimes, arming it to the teeth with the full and undeniable knowledge that they are enabling massacres that recklessly, and in many cases, deliberately, target civilians. And these 18 months of atrocities have barely merited a mention in the U.S. election, despite the key role the leading candidate, Hillary Clinton, has played in arming the Saudis, to say nothing of the millions of dollars her family’s foundation has received from its regime (her opponent, Donald Trump, has barely uttered a word about the issue, and himself has received millions in profits from various Saudi oligarchs). One reason American and British political and media elites love to wax eloquently when condemning the brutality of the enemies of their own government is because doing so advances tribal, nationalistic ends: It’s a strategy for weakening adversaries while strengthening their own governments. But at least as significant a motive is that issuing such condemnations distracts attention from their own war crimes and massacres, the ones they are enabling and supporting. There are some nations on the planet with credibility to condemn war crimes and the deliberate targeting of civilians. The two countries who have spent close to two years arming Saudi Arabia in its ongoing slaughter of Yemeni civilians are most certainly not among them.